TheDig­ni­ty Memo­r­i­al® Kiosk sig­nage was designed to help fos­ter brand aware­ness and align with their brand pur­pose of cel­e­brat­ing the lives of our loved ones. 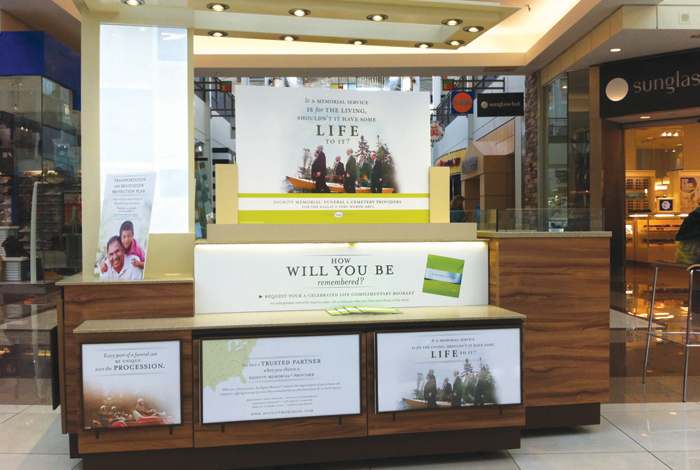 Since the place­ment of the Dig­ni­ty Memo­r­i­al® kiosk was in a mall, the pan­el designs need­ed to incor­po­rate fam­i­ly imagery that was in-tune with the brands mes­sag­ing — cel­e­brat­ing a life well lived. Call to action items were used to ease some­one into the pre-plan­ning con­ver­sa­tion, in addi­tion to high­light­ing some of their excep­tion­al ser­vices. With over 1,800 providers, Dig­ni­ty Memo­r­i­al® is the most trust­ed brand for inno­v­a­tive, val­ue-ori­ent­ed plan­ning prod­ucts and funer­al, cre­ma­tion and ceme­tery ser­vices dur­ing a time of need. PROJECT COMPONENTS: Pan­el designs. Struc­tur­al design was cre­at­ed by dif­fer­ent ven­dor. 2014 GDUSA Amer­i­can Pack­age Design Award.